Sometimes after our walk, Mommy sits with the neighbors and has coffee. So I decided it was time for Annie and I to have coffee. I ordered some Puppacinos and relaxed with Annie in the backyard. Annie and I decided we should have coffee breaks more often. Do you take coffee breaks? The other day we received these fab Farfetched apparel shirts. Bunnybell and I loved wearing ours while lounging in the San Diego sunshine. Annie wanted to know why she didnt get to wear a t-shirt. I reminded her that she doesn't fit into it since she ate too much during our vacation! Annie was very excited to celebrate Popcorn Day. So I prepared each of us an appropriately sized bowl to have throughout the day. I told her if she wants to act like a proper princess, she should not eat it all at once. I suggested that she take a few pieces out to eat, and then save the rest. But Annie still struggles as a Princess in Training. A bowl of yummies is not something she can walk away from. Well it is time to bark Aloha Maui. I wish that was barking Hello (like Adele) instead of having to bark Good-bye. I absolutely have loved the fab beaches and amazing scenery. I even have come to like the grass and flower fashions. Time to return to San Diego and my tiaras. 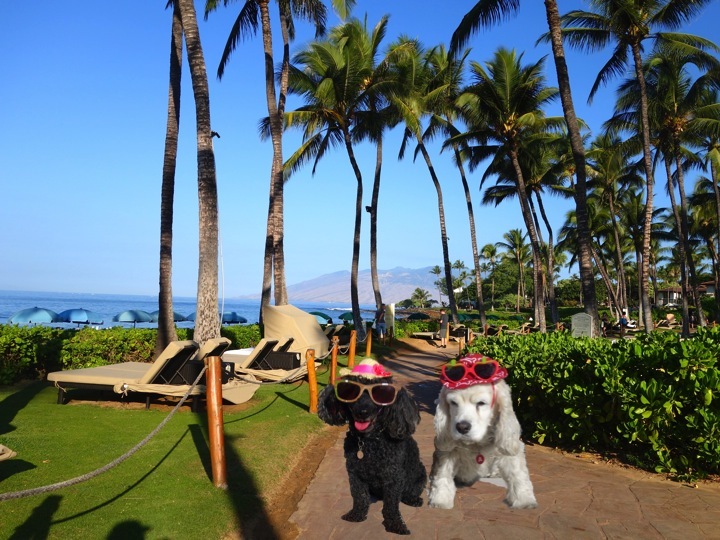 One of my fave things to do on our Hawaii vacation is take Annie for a stroll on the beautiful Wailea Coastal Walk. One day we met a kitty on our walk. I thought I would stop and chat and find out about his Hawaiian life. Annie of course jumped on the opportunity to take a nap. I really think she should be more social. 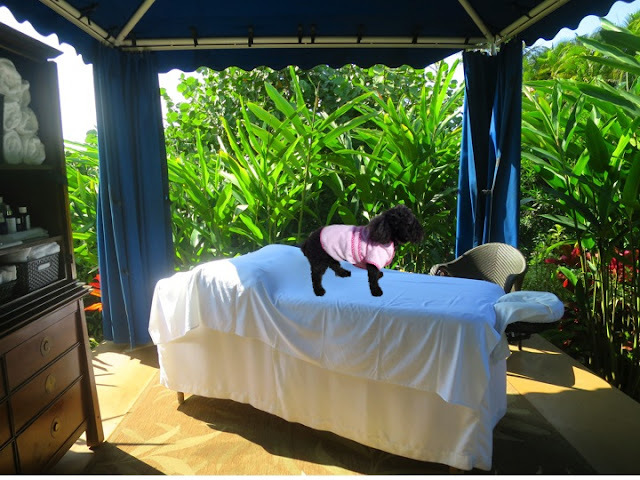 While Annie was taking her morning nap, I decided to get a massage in the outdoor cabana right by the beach. It was so amazing hearing the sounds of the waves while I had a Hawaian Lomi Lomi massage. Lomi means "...to work in and out, as the paws of a contented cat." It felt so good. When I get back home to San Diego I will try to find a kitty massage therapist. 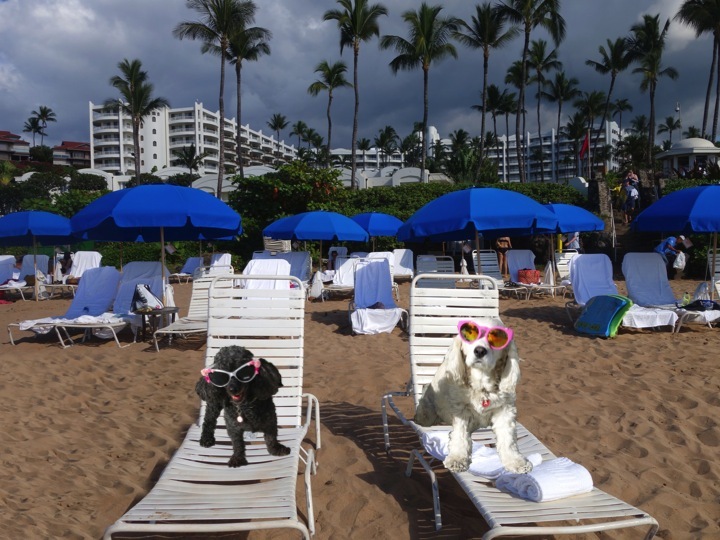 I just love hanging at the beach lounging out and enjoying the classic beauty of Hawaii. I was surprised that Annie preferred to hang near the pool, after all, she doesn't even like to swim. Then I figured it out. She heard that you can go to the swim up bar and order food. Typical motivation for Annie. I have been working so hard on my blog that I thought the New Year is a perfect time for a well deserved vacation. And what better place than Maui ?! I hate to travel alone, so Annie of course volunteered to join me. 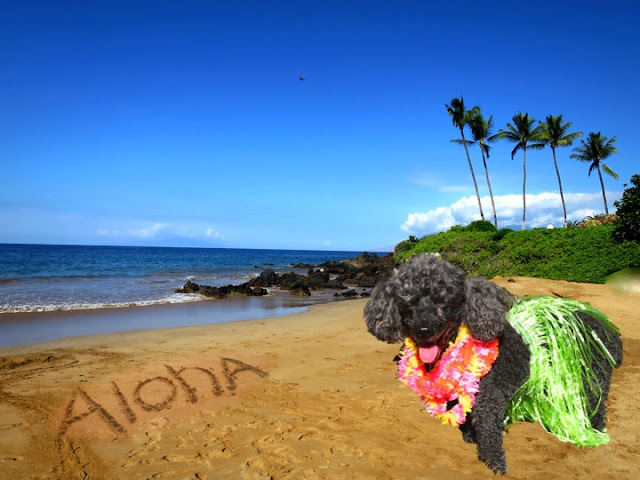 Today upon our virtual arrival we had a lei greeting-and they even knew my color! 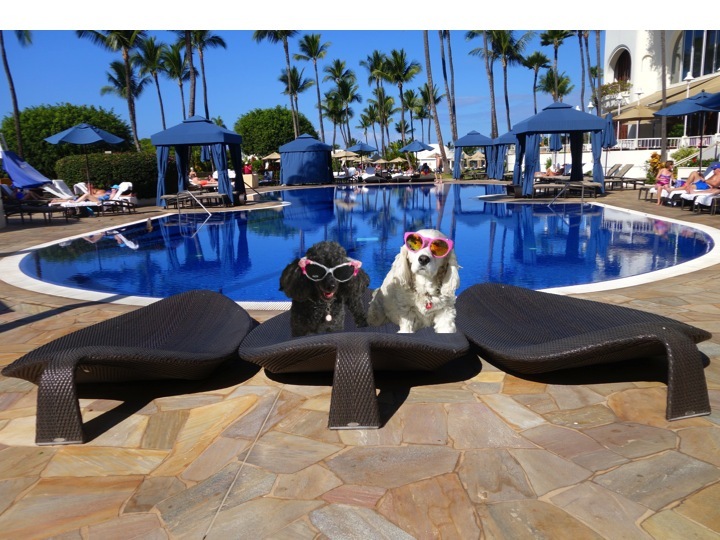 Our hotel, the Fairmont Kea Lani is beyond fabulous! 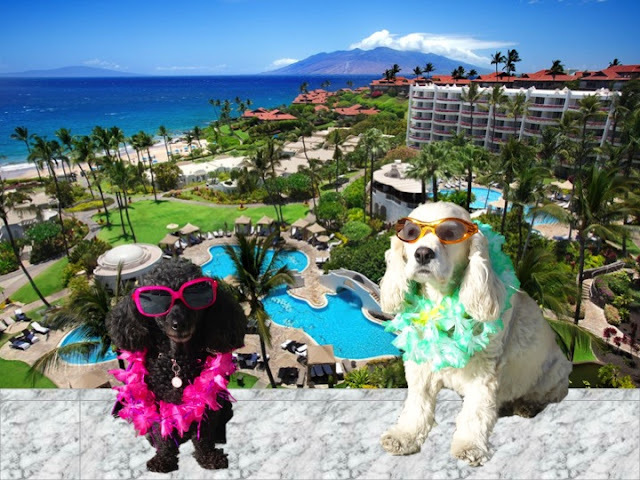 We can't wait to get to the beach! Today is Mommy's birthday. So Annie and I decided we wanted her to have a birthday breakfast in bed. I was in charge of setting up Mommy's tray. Annie was in charge of getting the food. I figured to match my elegant presentation, Annie would bring back some fab foods like scones, croissants and strawberries. But much to my dismay, in she walked with McDonalds bags. She was very proud. She got bacon, egg & cheese biscuits for everyone, so we could all have breakfast in bed. I should have known better than to delegate food selection to Annie. 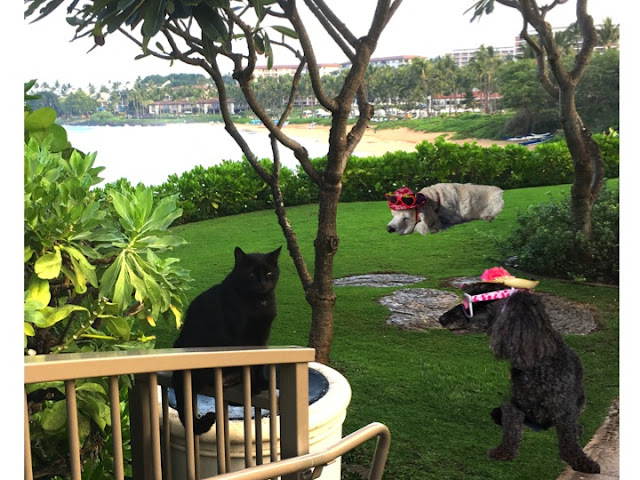 Before the holidays, we got to meet up with our friend Sugar again. 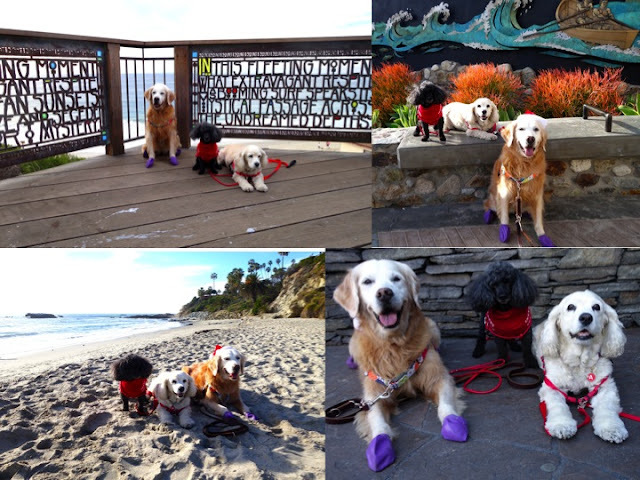 This time we went to the fab town of Laguna Beach. Everywhere we walked there were amazing photo ops. 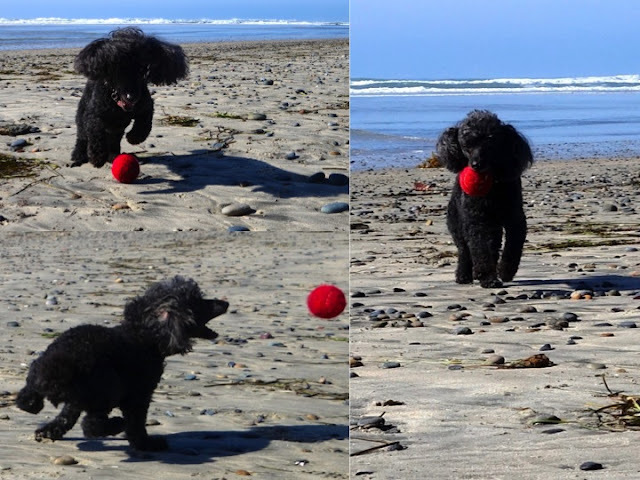 So of course Sugar's and our Mom kept on clicking away. I do adore Sugar, however, I get a bit jealous since she gets so much admiration from strangers even when I am around. But remember, my New Year's resolution is not to be jealous when others get attention; I am working on it. PS- You could get to know Sugar too at her fab blog Sugar the Golden Retriever !